We’re thrilled to introduce you to the winners of the Management 2.0 Challenge—the first phase of the HBR/McKinsey M-Prize for Management Innovation. In an era when recruiting and training more closely resemble “speed dating” than traditional apprenticeship, world-leading ophthalmic lenses manufacturer Essilor International pioneered the LOFT (Learning Organization for Tomorrow). What began as a request for standardized, global training materials became a dynamic internal, collaborative program that uses Web 2.0 technology to disseminate knowledge and transforms shop floor workers into peer trainers and coaches. The LOFT harnesses the knowledge and power of ordinary workers to bring measurable return on investment, astounding many Essilor executives. The unlikeliest of workers bloomed under the confidence of their peers. Apprenticeship found its place in the 21st century. Essilor International traces its heritage to the beginning of the industrial revolution, but its trades (lens design, casting, and polishing) are far older. To learn these trades, workers traveled to meet with masters and learn different techniques, relying upon the same European apprenticeship model of transmission as medieval cathedral stone casters. But while the equipment of many other industries became digital and “nanoscale” 20 years ago, these technologies are now entering the ophthalmic lens industry at full speed. As experienced Essilor workers are retiring in mature markets, the company often hires people with a mechanical or chemistry background, as there is minimal higher education dedicated specifically to this industry. New hires in growing markets often have little awareness of what is involved in the production of ophthalmic optics, because other industries (earlier adopters of digital and nano-technologies) are now attracting more resources and driving higher education to address their own specific needs. 2.0 tools and 2.0 principles applied to know-how transmission were pilars for bridging strong legacy and 2020 expectations. Rapidly growing demand. The market for ophthalmic lenses is growing by leaps and bounds throughout the developing world. Global workforce in need of specialized training. Each consumer has a unique pair of eyes that require a custom, locally created pair of lenses, from London to rural India. 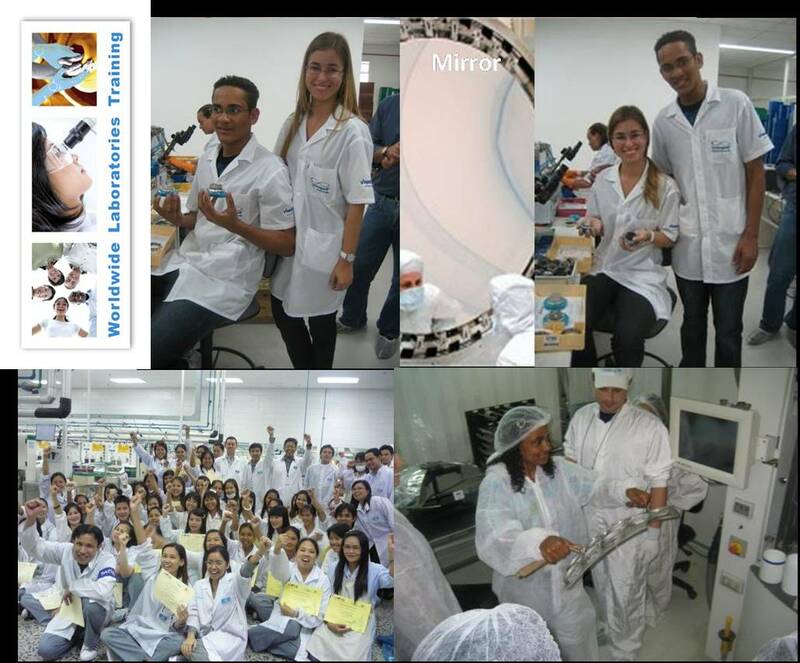 Essilor needed a way to quickly train new workers throughout the world in a complex trade with changing technology. 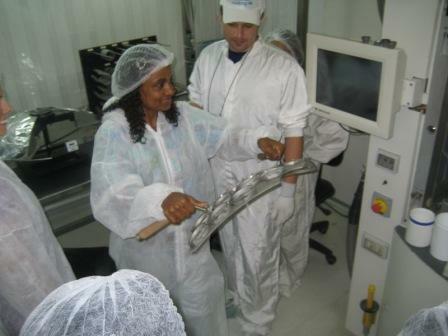 At Essilor, shop floor skills are continually evolving, and so are the methods for training new workers. Shop floor workers cooperate in continuous innovation groups and report best practices and new discoveries to their locally hosted social networking and personal pages, as well as to shop floor operators who have been selected as trainers. These trainers are in charge of the initial skills transmission for new hires, and they follow a very detailed script to help them develop their trade. This script evolves according to the innovations made around the world. Meanwhile, coaches focus on the personal development of both new hires and trainers. Coaches take care of the newly trained during what we call the ramp-up period, which will lead to official certification, if the new hire reaches the necessary quality, productivity, and autonomy goals. These coaches also coach the trainers on their training skills and behavior. Roughly 810 volunteer trainers and coaches spread over 102 sites in 40 countries are supported by a community of 1,400 workers who actively participate in idea sharing, and over 7,800 individual trainees benefit from the formal knowledge transmission. Because the trainers are volunteers from the shop floor, they remain in their daily jobs. Coaches are drawn from factory line leaders and experienced trainers. Essilor supplements the technical skills of these volunteers by looking for individuals with empathy and an eagerness to help and share. Meanwhile, HR often works with the coaches to implement new training games (documented on the community share space) that help workers learn their new trades. For example, in the Lat Krabang, Thailand laboratory, workers developed a blind-folded game that teaches new hires more about the aspheric design of a lens. This game was shared with peer coaches around the world, and the Thai innovators were very proud to discover their Brazilian colleagues pictured playing the game they created. At Essilor International, the talents of individual employees across the globe have become entangled, creating a web that supports the company’s daily operations. Entangled? In a sense where time and space separate neither people nor properties, like talent. Skills transmission is creating a very resilient bond. Across different universes, eventually. The analogy with light transmission (and photons particles quantum physic) is far more profound than an old saying. To break the code of complexity, and make it as simple as possible (but not more), you need smart observations and measures. And innovative techniques to trap knowledge (by slowing down key elements for step by step catch), know-how, key gestures and best practices elements. This applies to people management, Human Resources, and talent development. Challenge: Many Essilor employees lack Internet access; others have only personal email addresses or social network pages. Meanwhile, the organization is largely decentralized and capillary in design. Solution: Rather than relying on expensive traveling experts and trainers, we empower operators loca lly. Twice each year Essilor hosts physical events that mix workers from different countries--for many, their first time traveling outside their home countries--to share ideas. Local networked personal pages and social networking tools allow most workers to share their ideas and knowledge with the overall community. Managers use this information to create ongoing Best Practices articles that they post and promote through a collaborative share space (basic from the shelves SPS technology at no cost but. used in all dimensions from pictures to news ro interactive maps.cf detzils in materials ppt). Between the bi-annual conferences, their own experience, and the ideas translated and posted to the collaborative share space, the volunteer coaches and trainers are well equipped to help their peers. This has largely alleviated the “brain drain” that can occur when a knowledgeable worker leaves the company. The LOFT initiative has empowered people that few would take a chance on, including those very new to the job. From young junior operators in Thailand to demotivated, soon-to-retire senior workers in developed countries, the LOFT encourages all workers to share their experience. For example, a shy Ukrainian woman working in an Essilor Canada factory spoke little English or French, but today she is a valued trainer who transmits knowledge in Russian to Polish newcomers. Challenge: In developing countries, many new workers know little to nothing about ophthalmic lenses. They are more likely to have a cell phone than a pair of glasses. The complexity of the trade is hidden in the transparency of the lens. Solution: One LOFT training game includes three keys, the first being “Know your trainee.” Volunteer trainers are taught to ask some background questions of a new hire, looking for specific skills or analogies that might help them better understand their new trade and related hidden secrets. The localized nature of LOFT allows for this training to be better tailored to the individual, improving comprehension and facilitating knowledge transfer. We discovered that in order to become truly global, our only solution was to become deeply local. Not for the sake of playing with words. Training and Pedagogy were supported with a key motto, explained, transmitted and leveraged across all cultures : " You (and we) don't know what you don't know ." And to make complexity look more familiar. Time to learning reduction of 50%. Rapid acquisition now takes four weeks versus eight, while experience building time has been reduced greatly. A mastery level that had once taken three years to achieve has been reduced to around one year of LOFT training. Time to transmit. Training time investment includes process control limits of 5% as the minimum and 20% as the maximum for Trainers. This is to guarantee their shopfloor operator jobs remain their core mission and skills. Coaches have a best balance time allocation of 20 minutes per new operator per week. Gold level trainees typically face 26 weeks with a 3 hours effort every week. Measurable ROI. The benefits of LOFT training have been both proven and reproduced, and there is a documented loss created by delaying or failing to use LOFT training. ROI was achieved in less than one month. Quality improvement increased by 50% and dispersion reduction by 70%. These numbers are not only showing ramp-up from beginners and/or a weak baseline. It has been showing exact same magnitude for specific stations with high standards over 99.5%, and operated by teams with experience bell curve centered on 15 years (and spreading from one month to 41 years). A simple model (Google Docs kind of spreadsheet capabilities) is provided to proximity managers to populate their very local specific real numbers such as labor costs or working hours, as well as cost of goods with any kind of supply chain costs or portfolio mix. Sustainable, Web 2.0-scale improvement. Essilor has seen the 1:10:100 scale effect that is typical to Web 2.0 technologies. 810 trainers and coaches inspire 1400 workers to contribute to the training of over 7,800 individuals. LOFT participants have shared over 8,000 pictures and ideas. There is also a micro corporate team of 4, that is focused on solving sustainability problems, thanks to this unique diverse 2.0 community of 2,000 enablers of individuals and talents development. It is now an autonomous eco-system. Operators as well as experts can do extraordinary things with extra-care and a true share of voice. In a time of crisis or budget austerity, limited resources in the war for talent may instead be successfully used to better train the workers you have and those you can afford to hire. Management innovation and Web 2.0 tools both provide great opportunities for individual growth and multiple ways to benefit the company. The very last powerpoint file is displaying a lot of live pictures with detailed explanation of what is happening and the role of every actor and social learning tools. I strongly recommend to take a look at the slides as the LOFT system is made of many different elements and levers. A couple of innovation are not easy to catch with a white paper and will appear clearer on these commented snapshots. "The community stagnates without the impulse of the individual. The impulse dies away without the sympathy of the community." I hope this article will generate a substantial discussion. Interesting to get the proof that "Community" was already so trendy in the 19th century. I has interesting discussions off-line with colleagues about the reference to "Quantic examples" being difficult concepts because quite new...well it is now over 100 years that ideas and words were created. It is time to use it into a "Innovation" oriented web2.0 iniative.Even if Management related, as opposed to a scientific community. What is important to me is that we see and read a lot about the war of talents that we are already facing.However it is often only about the knowledgeable ones, or leadership competencies at the top of the pyramid level. Social learning in this case also opens the door for the biggest chunk of the workforce. Operators are not look alike people you can change overnight. As soon as you invest in training it is not true any longer, and you are saving real money. It is not a given that taking special care of a couple of High potentials already highly educated is a better investment. I really enjoy reading your article and looking at all the great pictures. The pictures tell all. The face-to-face meeting (biannual conferences) is such an excellent way to unleash employees’ potential and come together as a whole team. The LOFT Training sounds like a powerful initiative to engage everyone and share best practice and ideas across the organization. It is very interesting that even though some workers do not speak the same language, they are still involved as a whole team, which makes this organization a truly global one. Also, with your measurable ROI, I think many other organizations can learn from your company and mirror your innovation success. Thank you very much Angela for your comments. I like very much your last expression "...and mirror your innovation success". Image dear to our concept as you know. 1.ROI : we have been able to take into account all the local parameters such as the cost of labor and products mix for each site to value the interest of training for each local situation. 2.Languages : beside the amusement (that is a good lever for training and for "listening because not able to speak") brought by any situation where people need to communicate without mastering the same native tongue, the use of free of charge tools such as automated translators on social pages is really the nice gift from the 2.0 and open source world. 3.Face to face meeting : we do such meetings and gather for instance people from India, China and Thailand together on a regular basis. Although it is something we cannot afford and apply to the overall community. It would be nice but cost efficiency has push us to encourage engagement through cheaper venues.The post and sharing of pictures is a key part of the answer. 4.Pictures : we love them. Thousands of them have been posted on different media by our "hyper local reporters". It is always a tough job to select one out of so many. I am very happy and proud that you shared your interest in such captures. I am glad you got this difficult but important point.Interactions are of many kind.My favorites are attraction (that we can transpose into engagement) and transmission (of energy on a daily basis and of know-how on the long and sustainable run). Quantum is an early 20th century discovery that is turning 100 years later into the 21st century most radical evolution for many applications domains (i.e Medecine, Electronics, Optics, IT etc...). Let's take advantage of it into Management and Human resources. I think it is time by now. How does this fit with quality management programs? How do destructive deviations get detected and eliminated and the useful improvements acknowledged and promoted? Teams often do not know what is good (because it was easy, therefore not noticed by the team itself). Teams are often proud of innovating a workaround to a symptom that could have been eliminated at the root cause. The LOFT system is "entangled" with the Quality System. To be precise, it is now embedded into what we call the "Essilor Production System". It is actually a "sensor " for the quality system, giving precious information about deviation. You are very right about deviation and standards.The natural way for any given thinking operator (technicians and engineers a swell) is to find a workaround either to solve a local and temporary issue or to gain productivity (often with high risk of negative impact on quality because of the root causes you are highlighting). Coaches are trained on such techniques as "5 why's" questioning in order not to solve issues but to push the operator understanding and discovery of root causes and reason for a standard or a gesture. Not an easy job...but it is on of their "gold level coaching " goal. 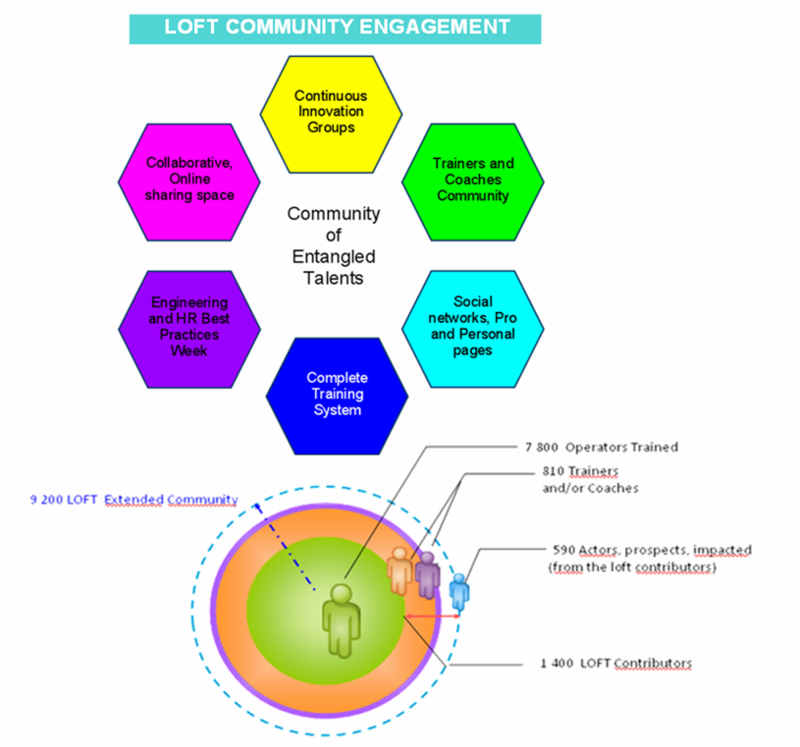 Concerning the promotion of improvements, the LOFT community is leveraged to spread the word. The trick is to understand that their is a new paradox, directly linked to the level of action. The responsibility for the qualification of new processes down, to shop floor gestures is split between global and local managers from Quality or Engineering departments. The LOFT Trainers and Coaches are legitimate to relay new instructions designed at local level as well as at global (worldwide) level. Some engineers understand it is a true communication amplifier media to speed up such improvement roll-out ,on the top of classic newsletters or webinars channels. The cherry on the cake is that discrepancies are showing up thanks to this double level inputs. This is how it is a useful sensor for the Quality Management. I just added a couple of metrics and pictures explanations both in the text and in the materials for your interest for deeper understanding or data based details. Entanglement concept and daily life meaning have been further explained and ilusstrated in the past powerpoint. Screenshots of some social learning tools used by the LOFT community have been added. I wish this can help anyone interested in understanding all the details behind the curtain that cannot fit into the short displayed format. Let me know if you need any explanation and please do not hesitate to comment.